In a medium pot, heat 2 tsps. olive oil on medium high. 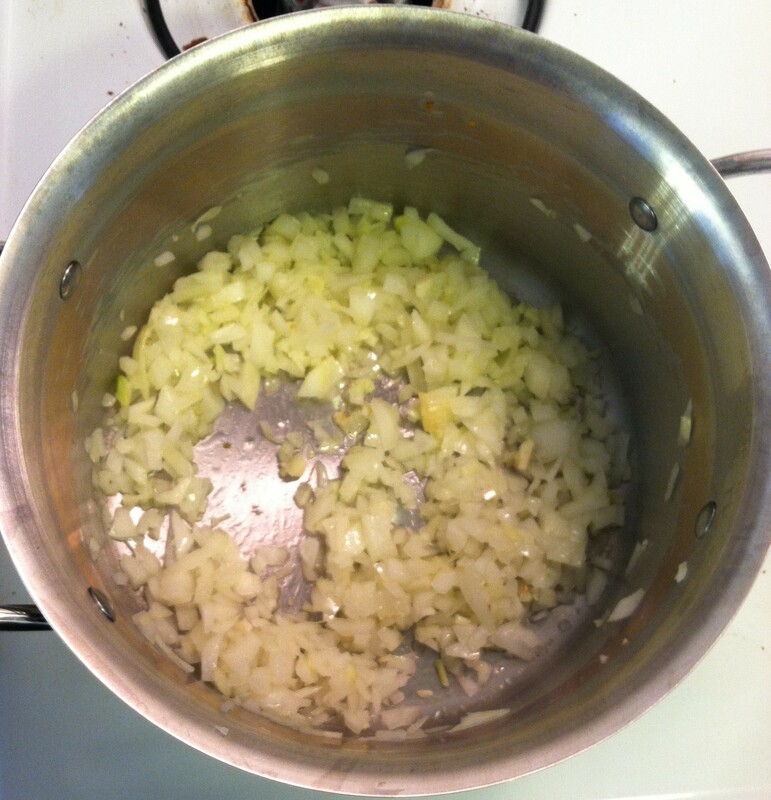 Add in the onion and garlic. Season with salt and pepper and cook for 3-5 minutes, stirring frequently. Stir in the tomatoes. Bring the sauce to a boil then reduce the heat to medium low. Cook 12-15 minutes until thickened, stirring occasionally. Remove the tomatoes from heat and season with salt and pepper to taste. While the sauce is cooking, place flour and breadcrumbs into 2 separate bowls. Working one slice at a time, completely coat eggplant in flour, then a thin layer of the chia mixture and finally the breadcrumbs. In a large pan heat a thin layer of olive oil on medium high until hot (add a few breadcrumbs to the pan and if they sizzle immediately it’s hot enough). Add the coated eggplant (to avoid overcrowding you may need to work in batches) and cook 3-5 minutes per side until golden brown. 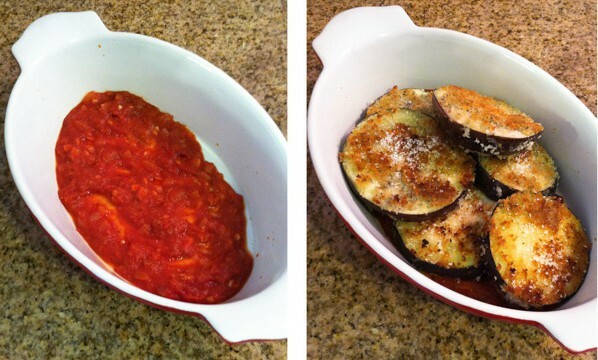 Once cooked, transfer the eggplant to a paper towel-lined plate and season with salt. 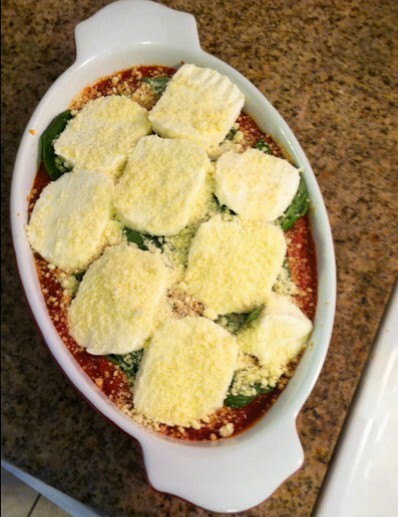 In an oven safe baking dish, spread a thin layer of the tomato sauce. Evenly place the eggplant rounds in the dish. 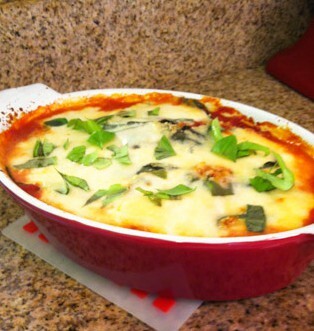 Cover the eggplant with the remaining sauce, the basil (reserve a bit for garnish), and the mozzarella. Sprinkle the parmesan all over the dish. Bake the dish for 15-18 minutes until golden brown and bubbly. Roughly chop the remaining basil leaves, garnish and serve! in a medium bowl combine chia seeds and 1/2 cup water. Let stand until thickened and gelatinous. cut off and discard the stem and bottom of the eggplant. Slice the eggplant into 1/2 inch thick rounds. Stir in the tomatoes. Bring the sauce to a boil then reduce the heat to medium low. Cook 12-15 minutes until thickened, stirring occasionally. 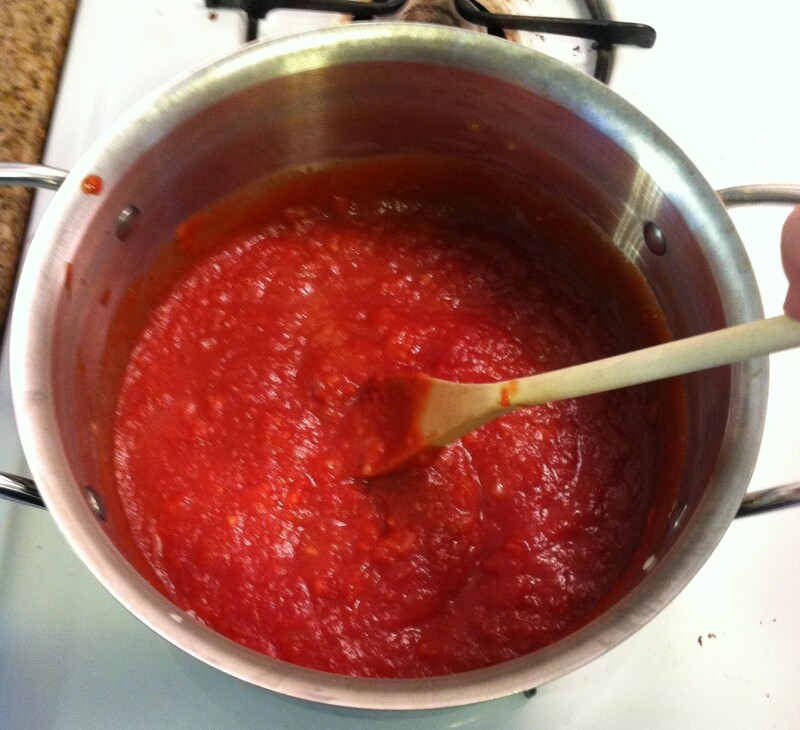 Remove the tomatoes from heat and season with salt and pepper to taste. While the sauce is cooking, place flour and breadcrumbs into 2 separate bowls. working one slice at a time, completely coat eggplant in flour, then a thin layer of the chia mixture and finally the breadcrumbs. In a large pan heat a thin layer of olive oil on medium high until hot (add a few breadcrumbs to the pan and if they sizzle immediately it’s hot enough). add the coated eggplant (to avoid overcrowding you may need to work in batches) and cook 3-5 minutes per side until golden brown. 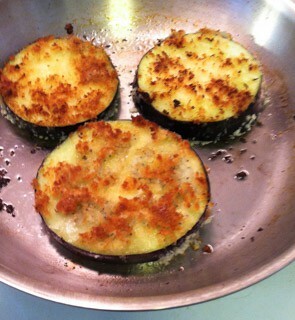 Once cooked, transfer the eggplant to a paper towel-lined plate and season with salt. 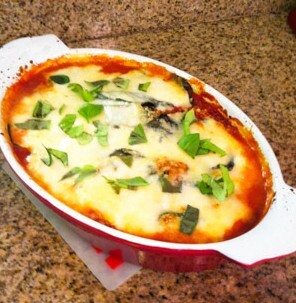 In an oven safe baking dish, spread a thin layer of the tomato sauce. Evenly place the eggplant rounds in the dish and cover with the remaining sauce, the basil (reserve a bit for garnish), and the mozzarella. Sprinkle the parmesan all over the dish. Bake the dish for 15-18 minutes until golden brown and bubbly. Roughly chop the remaining basil leaves, garnish and serve!